Bridget Smith began her career at Dunham Literary, Inc. in June 2011. Previously, she was an intern at Don Congdon Associates, worked at a secondhand book store in Connecticut, and evaluated short story submissions for Tor.com under Liz Gorinsky and Patrick Nielsen Hayden. She graduated from Brown University in 2010. While there, she studied anthropology and archaeology, worked as a radio DJ, fenced on the varsity team, and helped design an experiment that she later performed in microgravity at NASA. A lifelong fan of children’s books, she’s looking for middle grade and young adult novels in a range of genres, including fantasy and science fiction, historical fiction, romance, and contemporary, plus anything that bends the rules of genre. 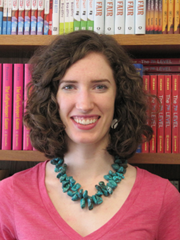 She is actively seeking books with underrepresented or minority characters. She is also seeking fiction for adults, especially fantasy and science fiction, historical fiction, and literary women's fiction. This is impossible. Impossible! But I can give you three favorite generalities: the Harry Potter series, the works of Diana Wynne Jones, and the works of Robin McKinley. Three writers who are clever about how they use their influences, who populate their stories with fully realized characters, and who write with distinctive and vivid voices. Three current TV favorites include Hannibal (transcendently dark and perfectly weird – I’m a huge fan of Bryan Fuller), Parks and Recreation (hilarious, sweet, well-realized cast of characters), and Battlestar Galactica (brilliant storytelling that explores humanity in a fascinating way). Someone brilliant and patient and enthusiastic and understanding and self-sufficient and funny and best-selling. That exists, right? Ultimately, my ideal client is a writer who wants a balanced partnership with their agent and who is constantly striving to improve. To avoid getting too specific about genre, etc., what I want in all books are characters who will stick with me and a voice that shines, plus good writing and a distinctive point-of-view. My favorite thing is being one of the first to read a story and fall in love, then helping to bring that story to the rest of the world. When I say to myself, “I can’t wait until everyone else gets to read this book,” that’s how I know I need to sign something. My least favorite thing is probably the most common refrain in this interview series: sending rejections. Contrary to popular belief, none of us like it. But one agent (or editor) is not the only chance for that book, and more importantly, it’s not the only chance for that writer. This is a bit of a cliché, but it’s important anyway: read. Read some books thoughtfully and some books mindlessly. Figure out what you find compelling as a casual reader, and dissect what you admire as a writer, and understand the WHY and the HOW of story. Read in as many genres as possible: the more widely you read, the more you have to draw upon, and the less likely it is that your style will be an imitation of someone else’s. Besides, if you don’t enjoy reading, why are you writing? Can I pick three again? I’m divided between Oscar Wilde, who I think would be incredibly entertaining (though perhaps only tolerable in small doses), Jane Austen, who is whip-smart and witty, and Sarah Rees Brennan, who is hilarious and prone to absurd adventures. As you can see, I prefer to choose my lunch companions by how much I would enjoy their company. There are hundreds of brilliant, insightful writers who would be terribly boring over lunch, so why not pick those whose books I love and with whom I could have a conversation?